It has been a long time between demonstrations. It was fun, worth while and necessary. It is a fight for working class America. Rep, Grimm N.Y. supports the rich and powerful and has acted against the middle class and supports policies that would gut Social Security, Medicare and Medicaid. "STATEN ISLAND, N.Y. -- A large number of protesters gathered outside Rep. Michael Grimm's New Dorp office this afternoon, expressing their disappointment in the Republican's vote on the debt ceiling. 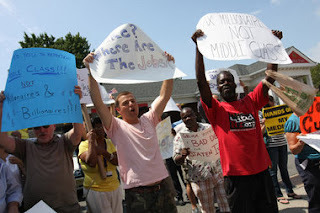 ...demonstrators took part, chanting and holding signs that read "Where are the jobs?" and "Restore the American Promise." Protesters lined up across the street from Grimm's 265 New Dorp Lane office."